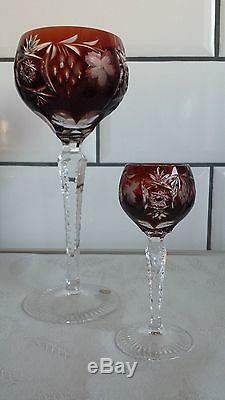 Up for sale is a set (2) of NACHTMANN glasses from the pattern TRAUBE (GRAPE) in ruby red. The wine hock is 8 1/4" tall, the cordial liqueur 4 5/8". Both are like new, no chips or cracks, from a smoke free home. Made in Germany in the 80`s. Mouth-blown and then hand-cut to perfection. Never used, only on display in china hutch. Beautiful addition to your existing collection or your chance to start one. The item "NACHTMANN TRAUBE cut to clear CRYSTAL WINE HOCK and CORDIAL LIQUEUR RUBY RED" is in sale since Tuesday, April 11, 2017. This item is in the category "Pottery & Glass\Glass\Glassware\Cut Glass\Vintage". The seller is "beltene" and is located in Las Vegas, Nevada. This item can be shipped to United States.